Laser levelers NOVAK: here is how they work! The laser levelers Novak consist of three items represented by a transmitter and a receiver of the laser beam and by the machinery itself. Specifically, the receiver mounted on the grader receives the laser signal emitted by a transmitter placed on top of a tripod, in order to achieve a correct leveling floor. Thanks to the introduction of laser technology on the market, a linear light beam of contained dimensions and high brightness can be sent over considerable distances. Such a laser beam will always remain powerful, small and readable over distances of several hundred meters. If a rotating pentaprism is used, which deflects the incoming laser beam by exactly 90° before it leaves again, a 360° reference plane can be created. The receiver system picks the signal up and reproduces the plane received by the laser transmitter using the tracked grader. 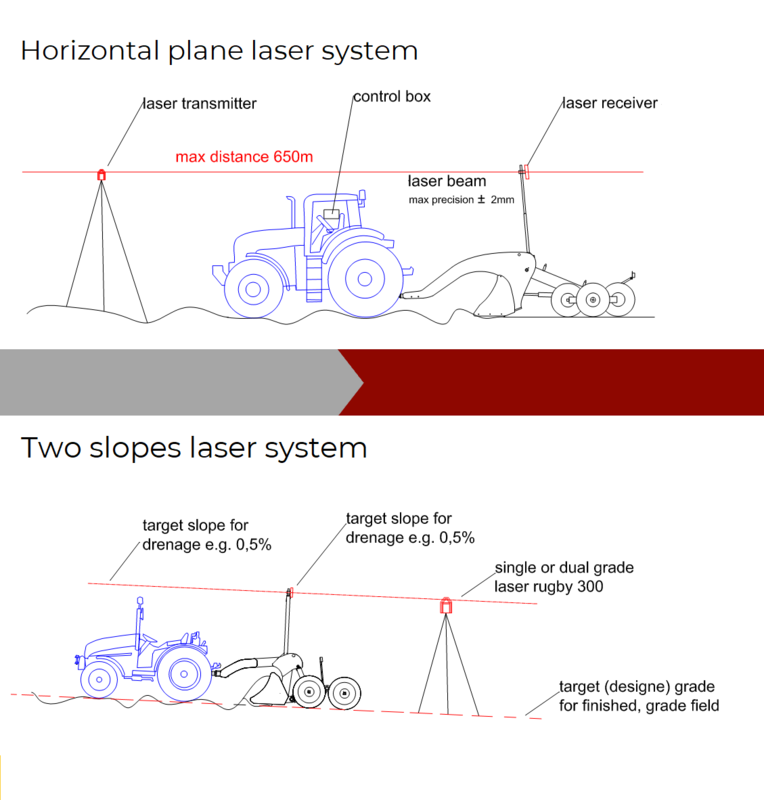 The laser transmitter needs to be placed on a tripod, at a height greater than that of the tractor or grader cabin, so that the receiver can receive the signal at any location across the field. Today, there are self-leveling laser transmitters available on the market that automatically generate a horizontal plane. They are also laser transmitters available that allow creating planes with 1 or 2 slopes, and this allows obtaining slanted plains in the field. The operating distance is up to about 650 m. NOVAK machines are compatible with all laser systems on the market. NOVAK produces the laser receiver equipped with special light-sensitive photodiodes in-house. These diodes are located so that the signal can be received in any position, covering the entire 360°. Thanks to the advanced technology of this element, it can operate also with very weak signals and is very insensitive to any external interference. The NOVAK control box has been designed for operation with the NOVAK receiver, a combination that enables the extra functions for wind disturbance correction, automatic laser signal recovery in case the reception range is exceeded, and the automatic grader power control that ensures an always linear machine operation. As already said, NOVAK machines reproduce the plane generated by the laser transmitter over the ground. To this end, the control box automatically manages the electrical and hydraulic controls that raise and lower the blade as is necessary to achieve the desired result. The accuracy of this processing remains always within ± 2 mm.